What does September hold for the Broncos? The two best seasons of Boise State’s Bryan Harsin era were 2014 and last year. The two worst Septembers were 2014 and last year. So what kind of stock are we going to put in what happens with the Broncos tomorrow at Troy, and at Oklahoma State, and at Wyoming? The expectations are that this 2018 squad should be better than Harsin’s best yet, so in that case, all four games in the month coming up are must-win. But if something goes awry, this team will not check out. Look where the Broncos ended up last year—compared to the scary landscape at the end of September. There could not have been a more discouraging loss than the 42-23 home defeat versus Virginia. Twice during the Harsin era, Boise State has recovered from two early losses to produce Mountain West championships and bowl victories, both of them over Pac-12 opponents and one of them in the Fiesta Bowl. The two seasons with the best starts, 2015 and 2016, turned sour down the stretch. The former had the back-to-back losses to New Mexico and Air Force on the blue turf, and the latter had the toe-stubbling at Wyoming and the Cactus Bowl rout at the hands of Baylor. But the pressure is on this season, as the Broncos are seen as good enough for a strong start, a strong middle and a strong finish. College football fashionistas are taking a hit this season. One of those under-the-radar rule changes enacted in the spring of last year mandated that, beginning with the 2018 season, “players’ pants must have knee pads such that the pants and the pads cover the knees.” The NCAA was concerned about the preponderance of “biker shorts” out there. Harsin said he examined the Colorado State-Hawaii and Wyoming-New Mexico State games last week to see how game officials were handling it. Harsin hopes—hopes—the Broncos have a handle on it at Troy. Otherwise, players could be sent to the sidelines to correct their wardrobe malfunctions. Hunter Pence of the San Francisco Giants has to be glad this rule doesn’t apply to baseball. Idaho opens tomorrow night at Fresno State, begging the question: how will the Vandals hold up against Marcus McMaryion? The Bulldogs quarterback has been in the program for over a year now—he eventually got on a roll last fall following his late transfer from Oregon State. Idaho returns only five starters on defense and allowed opponents last season to complete 61 percent of their passes. But they were pretty good against the deep ball, allowing only 30 pass plays of 20 or more yards, tied for the eighth-fewest in the FBS. Idaho went 4-8 last season, but it’s important to remember how close the team actually was to a winning campaign. Five of the Vandals’ losses—in fact, all of their Sun Belt losses—were decided by eight points or less. College of Idaho hopes to get its bread and butter back as it hosts Montana Tech in the home opener tomorrow at Simplot Stadium. For the first time since football’s revival, the Coyotes were held under 100 yards rushing last week, netting only 78 in their 24-21 loss at Eastern Oregon. Quarterback Darius-James Peterson, who took a pounding in LaGrande and was ultimately knocked out of the game on a roughing the passer penalty, has been back in practice this week in full pads. Peterson was limited to eight yards on the ground by EOU. Also, Idaho State opens at home tonight against Division II Western State in Holt Arena. This game will tell us next to nothing—the Mountaineers from Colorado were 1-10 last year and were picked to finish 10th this season in the Rocky Mountain Athletic Conference. Local pro sports snippets—it’s a rare Friday start on the PGA Tour to facilitate a Labor Day finish as the Dell Technologies Championship tees off at TPC Boston. Troy Merritt is in the field of 100 for the second leg of the FedEx Cup Playoffs. Hopefully the former Boise State star’s left arm, just four weeks removed from surgery at Saint Al’s to remove a blood clot, is healthy enough to help him compete. And the Boise Hawks fell 5-2 last night to Hillsboro at Memorial Stadium. 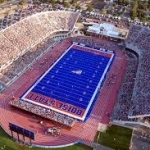 Hate to say it, but that clinches a fourth straight losing season for Boise. One more against the Hops tonight, then the Hawks wrap up the season this weekend with a three-game home series against Eugene beginning tomorrow night. August 31, 2013, five years ago today: Washington revels in the celebration of the grand re-opening of Husky Stadium and gets revenge against Boise State for a loss in the Las Vegas Bowl eight months earlier, routing the Broncos 38-6. An overflow crowd of 71,963 fans watched the Huskies win the battle of new no-huddle offenses by rolling up 592 yards behind senior quarterback Keith Price. It was Boise State’s largest margin of defeat in eight years and the worst loss in the career of coach Chris Petersen, whose remarkable Bronco record dropped to 84-9. It was just over three months later that Petersen would become UW’s new coach.